We're pretty sure no malice was intended. With these three words, the strangest victory speech in recent Australian sporting memory concluded. It followed a bizarre seagull moment. Let's backtrack a little here and try to make sense of all this. On Wednesday night, Melbourne City Football Club won its first major piece of silverware, the Football Federation Australia Cup (FFA Cup). That's the knockout competition that goes on while the A-League is happening, much like England's FA Cup and Premier League. Melbourne City beat Sydney FC 1-0, thanks to a great headed goal by -- who else? -- Tim Cahill. Here's the video of that and then we'll get to the weird stuff. So there was a significant seagull moment when a member of said avian species was struck, but Sydney FC goalie Danny Vukovic came to the rescue. And then it flew away! Phew. But like we said, the main talking point from the match was the strange victory speech by Bruno Fornaroli. The 29-year-old Uruguayan has a great knack for scoring goals. Public speaking, not so much. His whole speech seemed a little, well, let's say perfunctory. This is not to mock his imperfect but perfectly adequate mastery of English. It's about the whole vibe of the thing, the way he flicked from one card to the next, everything. Oh, LANGUAGE WARNING, by the way. 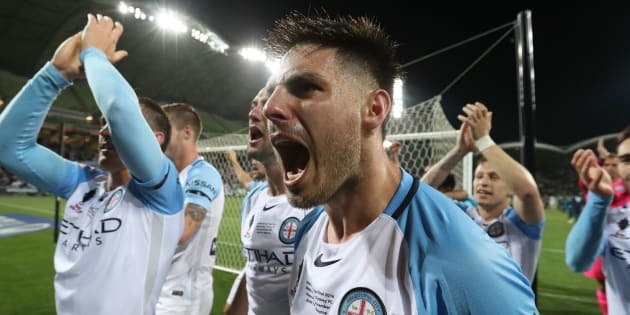 Towards the end of his speech, Fornaroli finally showed what felt like genuine passion as he thanked his teammates and the fans and shouted "Come on, City!". And then it happened. The final three words, said with a strange smile. Which clearly embarrassed football authorities. But why did he say it? Well, The Huffington Post Australia has contacted Fornaroli's management to try to get a hold on the sort of guy he is, and what he might have meant. No word from them yet (and we'll update if and when we hear something). For now, we offer a little theoretical perspective. It comes from our fluent Italian-speaking colleague Chris Harrison. Spanish, not Italian, is Fornaroli's native tongue, but they're both Romance languages from the same linguistic family. So Perhaps what Chris told us about the Italian meaning of the phrase "f--k off" also applies in Spanish. Perhaps. "In Italian, 'va funculo' (literally 'go f--k yourself' but translated in English as 'f--k off') is not quite as crass as 'f--k off', and because he throws the speech away when he says it, I think the f--k off was directed at the speech, which he probably doesn't like doing, rather than anyone present." Like we say, we'll update if and when we can confirm either way whether Chris' theory is on the money.